To date, China has sent six astronauts to space, and all six of them have been men. But that will soon change. China's outpost in space is about to welcome its very first inhabitants, and among the crew will be the country's first female astronaut. In just a few days, China will send three astronauts (aka "taikonauts") on a docking mission to Tiangong-1, the country's Earth-orbiting space station, including a female taikonaut who's yet to be chosen. One of the three Chinese astronauts... will be chosen from two women candidates — Liu Yang and Wang Yaping — according to Chinese state news agency Xinhua. Both candidates are members of the Chinese Air Force's Wuhan Flight Unit. If the mission is successful, it will bring China one big step closer to having the world's ONLY space station (the country plans to assemble its 100-ton outpost by 2020 — around the same time the ISS is scheduled to be retired and removed from orbit). 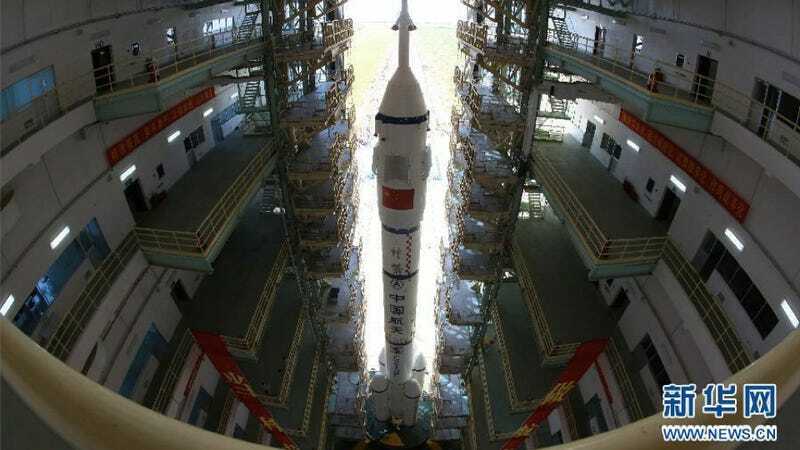 It will also go a long way in ensuring that China's nascent space program doesn't suffer from the same boys' club atmosphere that America's did when it was starting off.